The empyreal lords watch over the infinite expanses of the multiverse to ensure that good can flourish and that evil, no matter its form, can be vanquished. But even these powers cannot stem the tide of evil by themselves, and they must often rely on their celestial servants - noble angels, wise agathions, unrelenting archons, and free-spirited azatas - to lead the charge against the forces of corruption. Together, these virtuous forces wage an unending war against the blasphemous and the profane, all the while lifting worthy mortals to stations of ever-greater glory among the boundless celestial spheres. A thorough exploration of over 50 empyreal lords, including details on their minions, the divine powers they bestow upon mortal worshippers, and the celestial realms from which they hail. Rules for the mystery cultist prestige class and details on the various types of mystery cults. Methods to bolster mortal spellcasters' efforts while summoning all the different types of celestials. New spells for spellcasters to hurl at their wicked foes and new magic items to aid adventurers in their battles against evil. Rules for rituals of self-mortification and the divine powers that can be gleaned by such acts of devotion. A bestiary of five new celestials to assist or oppose player characters, including the keen-eyed spyglass archon and the veranallia, azata master of season, growth, and decay. 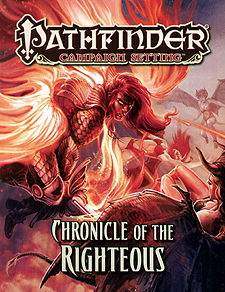 Chronicle of the Righteous is intended for use with the pathfinder Roleplaying Game and Pathfinder campaign setting, but can easily be used in any fantasy game setting.